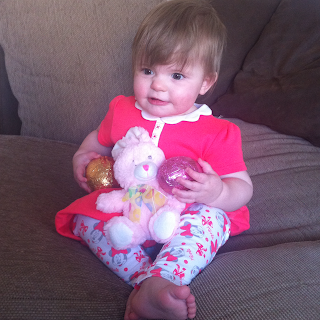 We had a wonderful Easter full of chocolate, rabbits and plenty of laughs. Paige wore her lovely new outfit that her nana and granddad got her, she also had a little taste of white chocolate and loved playing with her bunny. When I was younger each year for Easter I would get a bunny rabbit teddy, I'm hoping we carry on this tradition with Paige.